The 2018 Nominating Committee is seeking candidates for four seats in the April 2019 Oakmont elections with a deadline of Jan. 25 for candidates to summit letters declaring their intention to run for office. The committee is chaired by Ruthie Snyder with members Tony Lachowicz, Marlena Cannon, Bob Giddings and David Dearden. Snyder, who also chaired last year’s search, said the committee is focused on recruitment, encouraging candidates to run for office, or “throw your hat in the ring.” Potential candidates must be members in good standing of the Oakmont Village Association and not have served two consecutive terms in office. Snyder said she will submit a slate of candidates to the Board of Directors at its February meeting. The candidates’ biographies and other information will be published in Feb. 15 and March 1 editions of the Oakmont News. A Candidates Forum will be held in February, and OVA will also mail election packages with ballots to each home. “We are looking forward to encouraging some of our amazing OVA members to step up and run for this very important and consequential position for this community,” said Snyder. “It is a commitment of time and energy, but if you ask any of the current BOD members, I am sure they will tell you that it is worth it. Oakmont residents who would like to submit a letter of intent should contact Snyder or send the letter to Snyder or the board of directors. 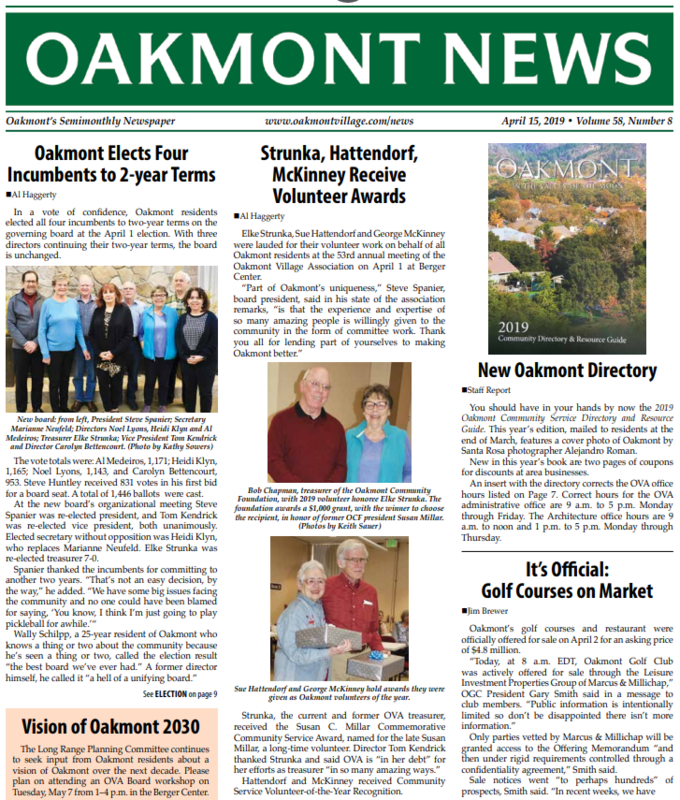 Details are available inside this edition of the Oakmont News. In accordance with election rules, Snyder said interested persons are asked not to contact OVA staff for election information. Positions up for election in April are currently held by Al Medieros, Heide Klyn, Noel Lyons (appointed to fill the unexpired term of Greg Goodwin who resigned recently], and Carolyn Bettencourt. All are currently eligible to run for re-election.